The Sculpture Workshop CIC in Wadebridge has received nearly £2k of funding from the Cornwall Community Foundation’s business arm. The £1,899 it received from Cornwall 100 Club (C100)will go towards delivering a series of workshops and the purchase of an IT system. C100 members Nicola Markham, sales director of Acorn Blue, and George Carlton-Smith from Carlton Smith Private Wealth, visited the workshop last week and presented the cheque to Richard Austin. 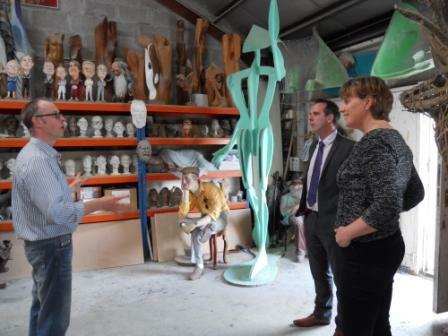 Carlton-Smith said “It is great to be able to support The Sculpture Workshop CIC. Richard Austin is clearly passionate about sculpture which really comes through in the way he runs the sessions. The Cornwall 100 Club, the business arm of The Cornwall Community Foundation, has granted £17,694 in March 2014 to help improve lives and communities throughout the Duchy. Chairman, Toby Ashworth, said: “As a Cornwall 100 Club member I am delighted to be able to support the grassroots organisations and their volunteers in our Cornish communities to maintain their work.